Huai Yuan (Origin of Huai) is the starting point of the Huai River. It is in my father's hometown, Nanyang prefecture, Henan province. 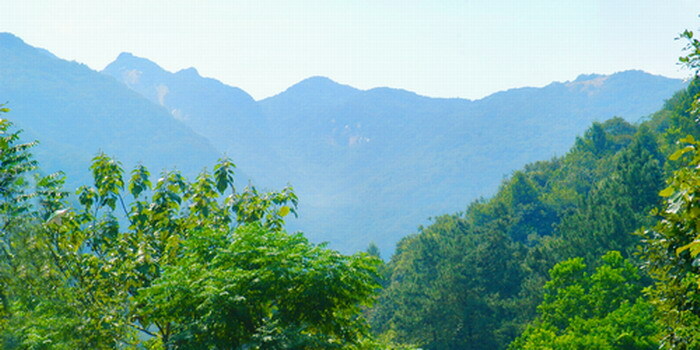 According to Tong Bo county history, it is situated at Tongbo Mountain's main north peak. In ancient times, the Huai River was one of the four big rivers in China that flowed into the sea. Tong Bo Mountain has a totem figure, Pan Gu, who created heaven and earth in Chinese mythology. Please see the picture of Pan Gu facing up. Exploration in inner China is an endeavor that requires intuition to go beyond the literature presentation. It won't hurt if you exercise some Sherlock Holmes' investigative skills, never take things at face value for convenience. When I traveled to Huai Yuan Origin of Huai River, my father's hometown, I discovered precious insights that oracle bones won't tell you. I was helped by my niece to have this rare tour of the Huai river origin. She asked her college classmate to give us an excellent tour. So my free thoughts were possible without the communist interference in trance-like touting their success story in defeating the nationalists. We were led to a pavilion with a well in it. What the guide told us is that here is the unruly water monster Wu Zhiqi's detention place. He was held by chains because he was in opposition against Da Yu's project to alter the course of the river. Huai River God has been jailed underground at the origin of the river, so it has been peaceful, silent and dead. He has been under house arrest for 5000 years. This doesn't make sense to me. It gives you a rare glimpse into a Chinese window of prehistoric politics. I assembled county books on local geography, folklore, prehistoric tales, and anecdotes. My investigation gave me a comprehension that is all the more precious in light of the communist current water project, Nan Shui Bei Diao (South water going north to help Beijing). The county digest book gives me an excellent insight. 5000 years of political opposition to be unified or uniformly conquered. China used to be like Europe, with each province a distinct country. All the literature says that Da Yu was a great engineer who pacified local opposition forces in his quest to change rivers to flow in certain ways. His father was executed as his way was to blockade the path of Yellow River. But it could be just the ice age; the river courses were newly formed, as the ice cap melted 12,000 years ago and there were many floods which submerged China. Nanyang is the world's eighth wonder, as we saw the dinosaur eggs underground to the west of Nanyang. According to the County book, Da Yu met local opposition in resistance and eventually the locals lost. Local people have his name inscribed on a hill, as he was executed for disobeying the order, fell in love with the local region and refused to take the order to change the river course. So people inscribed his name as a local hero. The Nan Shui Bei Diao project is forcing 700 rivers to flow in communist designated courses. This interferes with nature. A Soviet project starting in 1958 inserted a dam called Ban Qiao, interrupting the flow of local rivers, and destroyed local autonomous region leader Bie Tingfang's work on a regional irrigation system which was the pride of the entire nation. Asia's largest man made reservoir was completed in 1973. Ban Qiao dam could not stand the first major winter storm in 1975, and burst, killing 240,000.